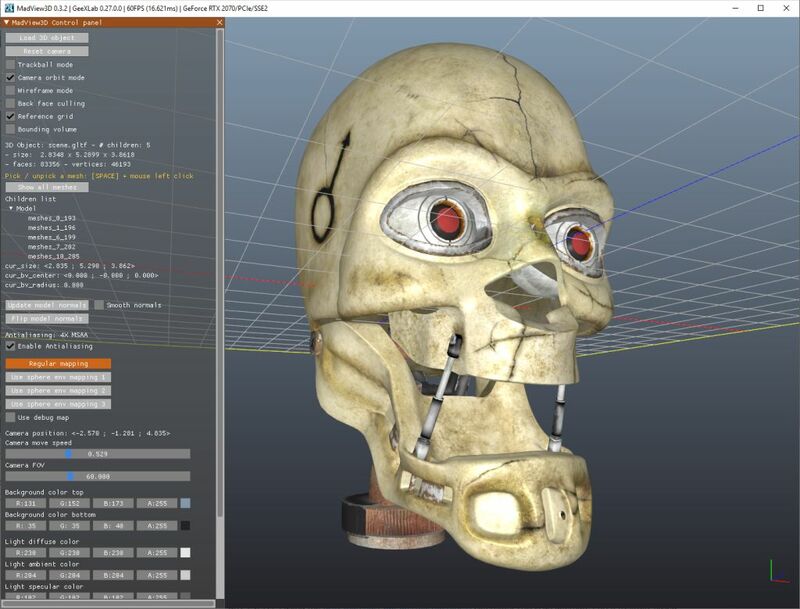 MadView3D is a 3D object viewer based on GeeXLab. 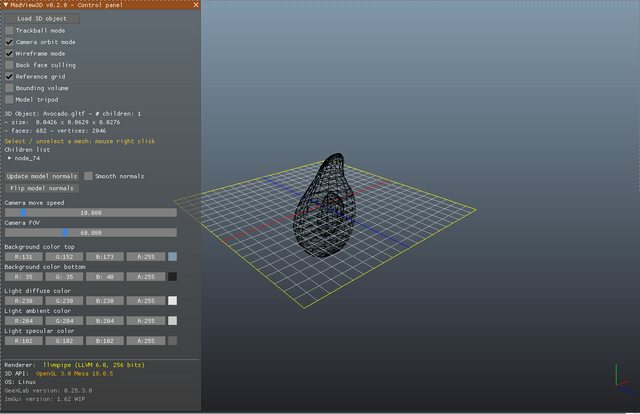 It can handle many 3D file formats. What do I need to do to solve everything is black(any objects load all black)? 09:21:02(0000006) [info ] GeeXLab is launched with admin (root) rights. 09:21:02(0000007) [info ] [SQLite3] SQLite3 version 3.24.0 - initialization ok.
09:21:02(0000008) [info ] GraphX Core 0.29.16.0 (codename: Hawking) initialization ok.
09:21:02(0000017) [info ] Command line: ./MadView3D /demofile="_src/main.xml"
09:21:02(0000020) [info ] OpenCL support not found: unable to load the OpenCL core library (libOpenCL.so). 09:21:03(0000021) [info ] [Assimp] ASSIMP 3D object loader plugin. 09:21:03(0000024) [info ] [Assimp] initialization ok.
09:21:03(0000027) [info ] Command line: ./MadView3D /demofile="_src/main.xml"
09:21:03(0000031) [info ] [Lua] LuaFileSystem initialized ok.
09:21:03(0000032) [info ] [Lua] LuaSocket core initialized ok.
09:21:03(0000033) [info ] [Lua] Mime core initialized ok.
09:21:03(0000034) [info ] [Lua] LuaSQL SQLite3 driver initialized ok.
09:21:03(0000035) [info ] [Lua] LuaGL initialized ok.
09:21:03(0000036) [info ] [Lua] initialization ok.
09:21:03(0000037) [info ] Current GeeXLab version is 0.25.3.0. 09:21:03(0000054) [info ] MadView3D - demo started with an OpenGL 3.0 context. 09:21:03(0000072) [info ] Scene compilation: SUCCESS. 09:21:04(0000091) [info ] scripts INIT execution: OK.
09:21:04(0000098) [info ] Material glTF.002: texture 0 (_src/../samples_3d_objects/gltf_model/glTF.002_baseColor.png) loaded ok. I only added OpenGL 2.1 and OpenGL 3.2+ shaders in MadView3D. by #version 130. 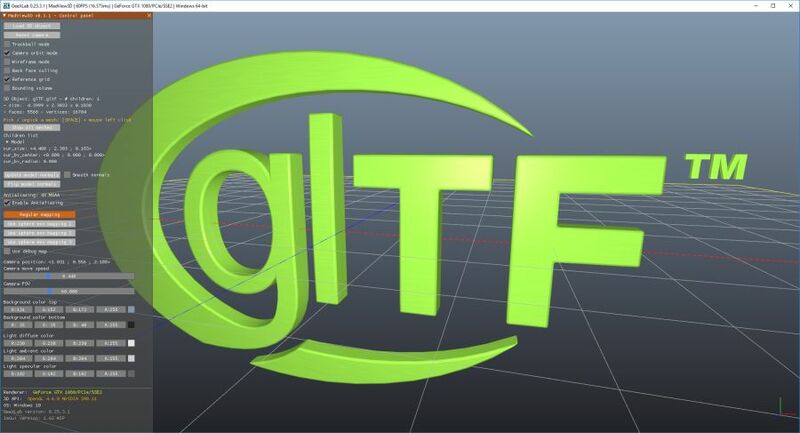 That should make MadView3D compatible with OpenGL 3.0. ERROR: geexlab::demo - Unable to initialize the 3d window win3d01 (renderer type: OpenGL). I did not try the updated graphics drivers, but I also installed the mesa-vulkan-drivers and vulkan-utils packages. btw, the MadView3D 0.3.x dylibs folder: you have libassimp in there 3 times, as symlinks do not work with zip files. Use tar.gz or tar.bz2. What's more the lib is not stripped (strip --strip-unneeded ; 80+mb > 14mb), you could compress it further with upx (14mb > 6mb). I found its the same with GeeXLab Free, you could strip down the download sizes significantly. If GeeXLab Free runs in your VM, MadView3D should run as well. One thing you can try is to change the OpenGL version in the _src/main.xml file. 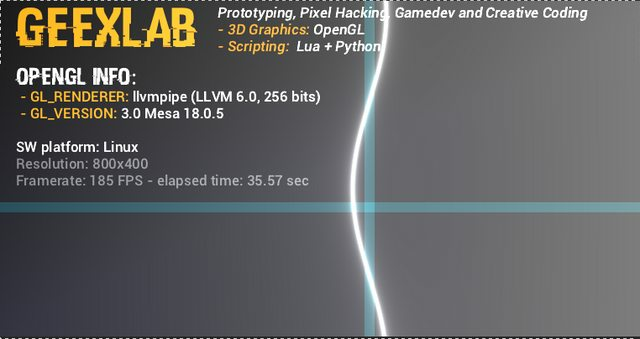 I will test MadView3D on a Linux box with OpenGL 3.0 (Nouveau driver), maybe I will see the issue. have now tried on real hardware, there it works. but the GTIF logo is black? is there something missing? Or is there a Lighting switch? Ok, I'm testing right now on Linux Mint 18.3 + Nouveau driver and I see the 3D model rendered in black. Probably a story of shaders. I'm going to fix it. Testing on real hardware is a bit postboned, I will report soon. 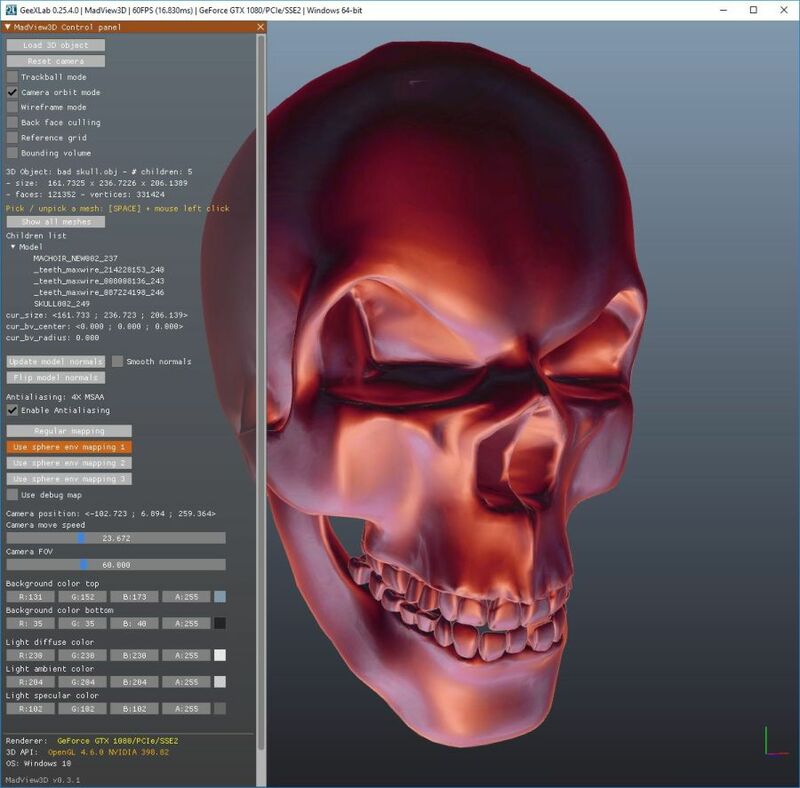 A maintenance version of MadView3D has been released.